So, I haven’t written for the blog in a long time. Believe me, there have been many serious issues about violence and abuse that I wanted to write about, but I just haven’t had the energy for it. I’ve chalked this up to a lot of things – the fact that work has gotten busier and life has been crazier lately, but the honest truth is that it is from losing something that has sustained me through this work for a long time: my self-care. Self-care is an essential part of working on issues of abuse in order to avoid secondary or vicarious trauma and compassion fatigue. Trauma and fatigue of this kind are incredibly common and serious issues for individuals who work directly and indirectly with victims and survivors of crime. For example, a study of Colorado child protection staff found that approximately 50% of workers suffered from “high” or “very high” levels of compassion fatigue. This trauma and fatigue can be debilitating and mimic the effects of Post-Traumatic Stress Disorder (PTSD) for the individual working in this field. As a result, practicing self-care has become an integral part of many social work and psychology programs as well as for a number of agencies working on violence and abuse. It has even made its way to the mainstream as a mechanism for the general public to cope with the massive amounts of traumatic information communicated through the news media on a day to day basis. So what is self-care? There are a number of different definitions, but the general idea is taking care of your psychological and physical health by recognizing the impact of trauma on your day to day life and honoring your needs by creating a balance between personal and professional life. People accomplish this in a number of ways – through healthy relationships, exercise, meditation, hobbies, etc. Valuing and prioritizing the things that feed our souls can support us in continuing to work on issues that can be traumatizing and disheartening. For me, like many others, I have multiple methods of self-care that I’ve learned I need over the years, such as hiking, cooking, photography, and spending time with family and friends. 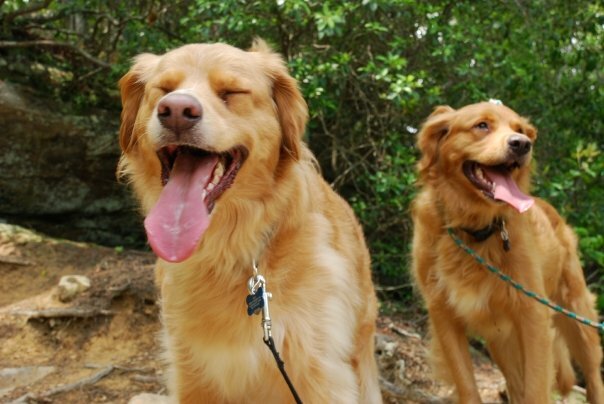 But one of the most indispensable forms of self-care that sustained me over the last 7 years were two shaggy, smiling, goofy souls waiting for me at my door at the end of every day. 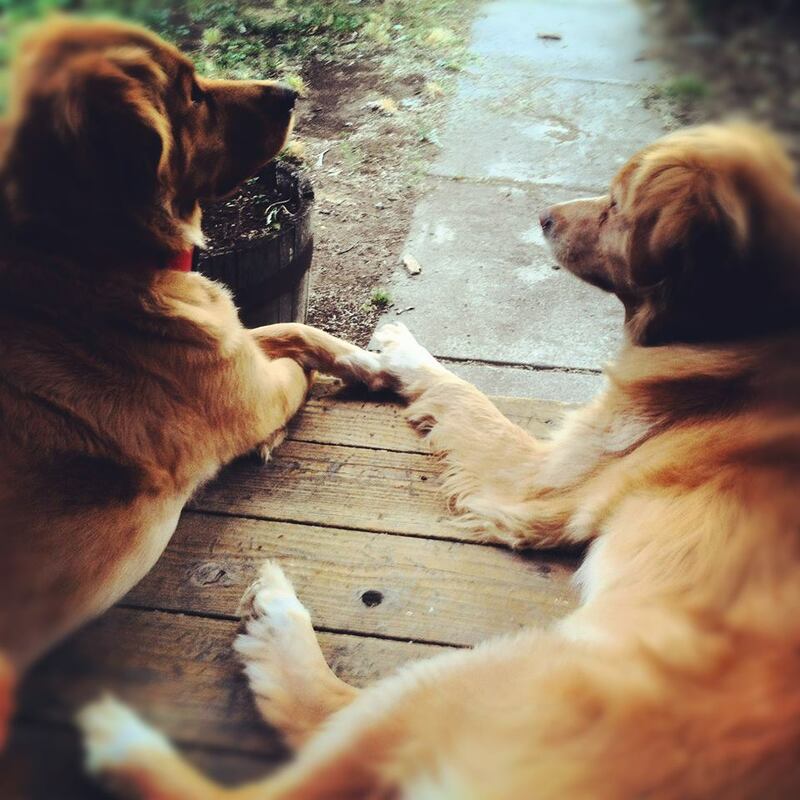 We got our two dogs, Mona and Pita, when I started my first job in the domestic violence field at a shelter in Tennessee. 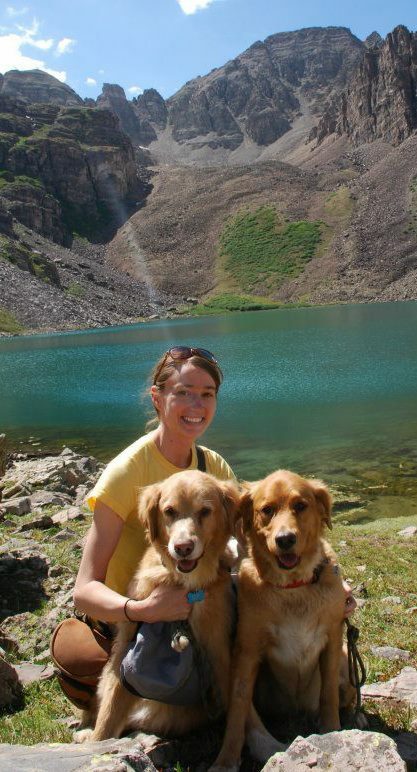 We lost them both to cancer this past March as I was settling in to a job in Colorado where I had decided it was time to take a break from direct work. Mona and Pita, our girls, were there for me through some of my first experiences with very complex and traumatizing work. When I worked in the courtroom as a domestic violence advocate and struggled not to take the stories of the people I’d worked with home with me or worry about the terrible dangers they faced when they went home themselves, the girls were energetic young pups who licked my face constantly when I walked in the door and made me laugh with their crazy antics chasing each other around our yard. When I came home from taking calls and coordinating tips of awful forms of abuse and exploitation on the national human trafficking hotline, the girls were slightly calmer in their older age and would lay on my lap and let me stroke their heads even while I was still sending out tips from my bed at night. Their smiling, goofy faces waiting anxiously for me at the door as I tiredly walked down the hill to our house, gave me an energy and strength that I can’t describe. Sometimes I would walk in the door and immediately collapse on the ground to hug them for as long as they’d let me before bombarding me with smelly dog kisses. On the weekends, we’d go on walks, hikes, camping and canoeing. They allowed me to heal from trauma and to still have faith in humanity after days of hearing some of the most awful things humans can do to one another. They showed me joy and love that I could have easily forgotten existed in this world. They were my constant companions. Now, I should acknowledge that I am also very fortunate to have an amazing partner whose support to me has always been invaluable. But something that we both agree on and feel strongly about is that our girls gave both of us a form of support that each other could not exactly provide. There is something about the unconditional love of an animal and the healing power it can have that is honestly, just magical. This isn’t something that my husband and I are unique in feeling – a study by a Swedish doctor has shown a strong correlation between the positive interactions with humans and their dogs with the release of stress-reducing oxytocin for both. We see this therapeutic relationship put into action with service dogs, hospice dogs and even with dogs to support victims of violence while testifying in court. Dogs and other animals can be such a powerful source of self-care. It is one that I always knew I had, but never knew how central it was to the work that I did and the life I was able to lead outside of work until it was gone. So what do we do when one of our primary sources of self-care is no longer there? How do we cope with that loss? Sometimes it may mean taking a step back from the work we do and recognizing the limitations that we have given this change. Other times, it may mean reworking our self-care structure and the things that we need to balance ourselves when experiencing secondary trauma in the workplace. For me, I know that reconstructing my self-care is a process that has taken time, but has been made easier by remembering what the girls taught me about life and love. I realize more and more each day how lucky I was to have their amazing spirit in my life and how much they helped me to smile and laugh when life seemed dark. There are terrible things in this world, but how we lift each other up and empower each other to move forward can be every day miracles. I am so thankful that I had two wonderful souls that helped me to do the work I love and care about so much, while helping me to see the miracles in the world I could easily have forgotten. I miss you and love you, my self-care, my goofy girls.